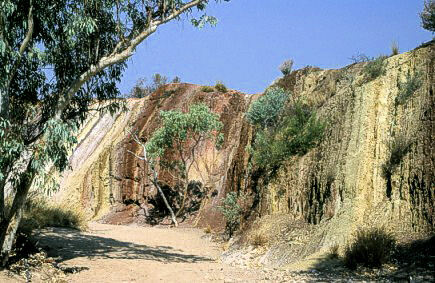 It is only a short stopover along the road, but very worth a visit: The ochre pitts. The ochre is the natural mineral paint used by the Aboriginals for their paintings and ceremonies. It's very impressive to see how many different colors can be found here side by side. A bit of modern rassism, but possibly necessary: white people are not allowed to remove the faintest bit, it's entirely for Aboriginals use.